As the years pass various books often become difficult to find, especially when the original company stops re-printing their books and shuts down. Such is the case with numerous manga series and one of these just so happens to be Phantom Thief Jeanne which was originally owned by CMX. Now Viz Media has rescued the license and have begun re-releasing the series with an all new translation and a few extra bonuses thrown in. The question is, should you pick up Phantom Thief Jeanne Volume 1 and become invested in this series? A thief who steals paintings and always manages to escape has been something of a blight on the police who see her as nothing but a criminal. She goes by the name Phantom Thief Jeanne and is always kind enough to send in a letter warning the painting’s owner that she will be arriving to steal the painting and give the police plenty of time to prepare for her arrival. The problem is, they never manage to come close to capturing the girl and often the people she steals from rarely press charges. While this thief steals by night, she is a cheerful and athletic high school girl during the day. Maron Kusakabe has a sad past involving her family abandoning her, but she remains strong and is the ace of the school’s rhythmic gymnastics team alongside her childhood friend Miyako. While Maron might be busy with school life during the day, at night she often is called upon by a little angel named Finn to steal works of art. You see, Maron is the reincarnation of Jeanne D’Arc and because of this she has special powers gifted to her by God. In an effort to weaken God’s divine power, the devil has placed demons inside of paintings and if a human were to see this painting and be moved by the artwork, the demon will take control of them. With her abilities, under the guise of Phantom Thief Jeanne, Maron tracks down possessed people and their paintings to steal these works of art by sealing the demons into chess pieces, freeing the possessed owner and leaving an angelic piece of art behind to replace the stolen art. Maron has been at this for about a month, but when a new boy named Chiaki transfers into her class and moves in next door, a new thief named Sinbad appears and is chasing down demonic paintings just like Jeanne. With a new thief that may be similar to her but could be working towards a dark goal and a new boy that seems incredibly interested in her romantically, Maron’s life just became a lot more complicated. Now Phantom Thief Jeanne Volume 1 actually offers quite a bit of information despite being set up like a heist of the week style manga. Sure each chapter involves Maron having to steal a new painting and deal with the demons that appear, there is plenty of time to establish her as a character as well as build up Chiaki and Sinbad’s motivations throughout this first volume. Oddly enough, very little is actually done to touch upon Maron’s sad backstory concerning her family, as it is only briefly mentioned despite it playing a major role in her emotional state and why she feels like she cannot love anyone or even trust anyone too deeply. It is also strange that, although it is very obvious to readers and Chiaki immediately makes the connection as well, that Maron remains fairly oblivious to the connection between Chiaki and Sinbad until it is revealed right in front of her eyes, though this mostly hints to the fact that despite her being athletic, she is a bit of an airhead sometimes. It is worth noting that Phantom Thief Jeanne was originally published back in 1998 so some of the artwork is definitely going to feel like it is a bit dated, especially when it comes to extremely pointed chins. That being said, a lot of Arina Tanemura’s art in this volume still holds up fairly well today and fits the shōjo theme that fans of the genre have come to expect. Whenever Maron is disguised as Jeanne her outfit is intricate looking and impressive and the same can be said for any full page panels that feature some nicely detailed art. It is also nice to note that the comedy in the visual gags, almost all are presented in chibi format which the series likes to slip into often, are almost always funny. There are a few strange areas in the volume where either the bottom half of a page or the left side of the left page will be blank and only ‘Phantom Thief Jeanne’ is shown which is a bit odd but doesn’t remove any actual panels from the pages. Also in at least two areas in the volume there are some editing issues where Japanese text has been clearly whited out in a block and replaced with speech bubbles, removing the art where the text was previously overlaid. 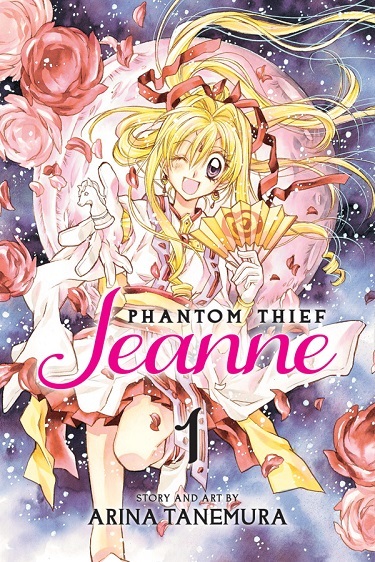 I will be honest and say that I do not know what was included in the original CMX release, but Phantom Thief Jeanne Volume 1 from Viz features a color illustration on the first page showing Maron surrounded by angels which is nicely drawn with a soft light blue color being the foundation and a small note from Arina Tanemura about the illustration. Other than that the only other piece of extra content are two sketches at the end of the volume, one of Chiaki and one of Kaiki, Chiaki’s father. Phantom Thief Jeanne Volume 1 does a great job establishing the plot and introducing readers to its charming core cast of characters. There are some key points that are only briefly touched upon despite their clear importance to the story, but it does leave something to the imagination for readers unfamiliar with the series and leaves off on an emotional cliffhanger between the two leads. There are even some extra sketches and a color page to help entice returning fans into revisiting the series, though the artwork for this volume does look dated it fits the shōjo feel nicely and there are a number of nicely drawn scenes and charming character designs that readers can’t help but adore.